Ralph Gracie—the letter R in Brazilian Portuguese is pronounced like an H if you hadn't already gotten that—sat in the space where the tatami, or floor mat, met the wall mat. His legs were bent at the knees and he watched the action on the mat, half a dozen men in jiu jitsu gi's, with a casual eye. "Do you remember what you said when we first met?" Standing some 14 years later in one of Ralph's three schools in the San Francisco Bay Area, bigger and much better than that first one, his eyes narrowed just the slightest against what may have seemed like a set up to him. Ralph, all 5'9" and about 170 pounds of him, had looked up and asked me "What do YOU want?" Like it couldn't have been anything good and whatever it was, well, bring it on. "You have to understand, back then, my English probably wasn't so good…." And then you remember the Ralph stories as they've piled up over his 43 years of life, in legend, in the newspapers and the back and forth that's part of a knowable but frequently unknown confederation of Brazilian jiu jitsu (BJJ) players, MMA fighters and just general badasses, of which Ralph is all three. Son of Robson Gracie who was son of Carlos Gracie Sr., the founder of a derivation of a Japanese martial art that's given birth to both fight obsessives all over the world, as well as the sport most healthily identified as MMA, Ralph did something slightly different with it. He matched it to his personality. "You have to understand," he says, "we all grew up together. No one forced jiu jitsu on us. It just was. I mean we did other things but jiu jitsu was what we did for fun, what we did to eat…"
"But you didn't compete when you were a kid." "I mean we had to fight to eat! The house was full of kids, all training. Older brothers, cousins, everybody altogether. Some days you had a good training day and we'd rush home and if you had done good that day you got more food. Or you could take it." Equal parts Lord of the Flies and some sort of Band of Brothers deal, it all sounds great and goes a little bit toward understanding that when, while still a teen, Ralph had said he was going to fight the whole family lined up behind him. Not so much for the W, which he got, but because this was all a part of the dinner time scuffles over food, the crazily good 24 hours a day of fighting, training, jiu jitsu. And Ralph's style both a product of and a departure from the traditional family style. Not gentle nor applied gently Ralph's style earned him the nickname The Pitbull: hard, aggressive and ON you. Which probably accounts for about half of the storied rumors attributed to the man. Not all of them good. Jason Slater, music producer and former student, remembers getting knocked out in class for going too hard against Ralph's instructions. "He came up behind me and punched me. As in, in the face." A tough love situation that while not so unexpectedly not that welcome by Slater, did set the scene for Ralph's early stage MMA dealies—7 listed wins, 1 loss (to the still competing Takanori Gomi)—as well as the backing of a team of killers featuring the estimable Dave Camarillo, Luke Stewart, Kurt Osiander, and BJ Penn. But the Ralph stories run wild and run deep and standing with the man in the early afternoon of a San Francisco day, there seemed to be no option but to ask the man himself. "You and a friend were playing video games and you started losing and the 'rumor' the way we heard it was that you started shooting him. With a BB gun." "Um. Yeah, yeah. That sounds like something I would do." "All the way out of your place. And down the street." 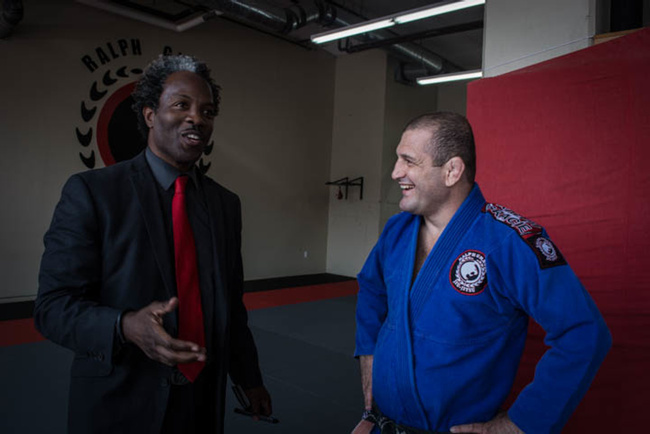 "Then we heard when you and Renzo [Gracie] trained and he'd get you that you'd never tap out. That he had to choke you out. Choke you out and then LEAVE the school since when you regained consciousness you'd immediately begin attacking him again." "I told you how we grew up. So all of this comes from that and being very passionate about jiu jitsu." "And then the time you were fighting after some traffic thing?" "Well the time that made the newspaper." "Look, you know, some guys want to get tough and then they want to sue and it gets publicity. Fehhhh…"
And the talk continues along until eventually the acknowledgment that he's got some "unfinished business", thinks he could avenge his one loss against a Gomi who just lost to Myles Jury at UFC Fight Night: Hunt v. Nelson and just in general makes it clear that whatever fire he had that got him there in the first place, is still there. There and burning, in the name and the mantle of the family legacy that he wears like to the manor born, is still the need/urge/desire to make manifest his will and a desire to get to the table with the first and fullest plate. And like he just did it before, it seems like he's poised to pull the trigger on doing it again. "Let me put it this way: there are a lot of guys I'd like to fight who are still fighting, who I don't see being able to beat me at all." Leading to a conclusion that if someone asked he'd be ready to answer. "If this is in your blood and you love to do it, like we do, you're always ready." He walks over and between the tight knots of people rolling and waves us off, head bending to the bodies on the floor, offering instruction every now and then or just watching. Closely. Intently. And yes, in all likelihood, always goddamned ready.